Da Nang is on the coast surrounded by beautiful beaches on two sides and the Han river running through the city. Around the city there are also mountains and many pagodas; it is an interesting place to stay and it offers easy access to surrounding places to visit, such as the ancient city Hoi An, only 20 kilometers south of Da Nang, and the Hivan Pass, a few kilometers north. Da Nang is in the middle between Ho Chi Minh City and Hanoi; there are many daily flights from either city with Vietnam Air or Viet Jet, which is a low price airline. Also if you are coming from Thailand, then Air Asia has recently started direct flights Bangkok to Da Nang. Also there is a regular train service from Ho Chi Minh or Hanoi. The travel time is about 16 hours from either city but the time can vary. Buses also offer overnight leaving in the afternoon and arriving in Da Nang in the early morning. There are many hotels spread over the city, from 5 star luxury to budget hostels. Some hotels offer long term stay at a very reasonable price. In low season you can find decent hotels for about 8 USD per night, in both Agoda.com or Booking.com. Finally, it’s easy to find rooms by just turning up, except at holiday times such as TET which is in February about the same time as Chinese New Year. In such a periods it is recommended to book well in advance. The best time to visit Da Nang is between March and August, in the dry season. Even if from June to August it can be very hot, there is always a wind from the sea, also it still occasionally rains anytime in the year. From January to March the nights can be quite cool and you will need a jacket at night, but the daytime temperature can be around 25° to 30° Celsius. It is easy and very nice to walk around the Han River between the Han Bridge and the Dragon bridge, but in some parts of the city walking can be difficult as you have to walk on the road: there are motorcycles everywhere you go, the kerb is taken up by restaurants and people selling things, and people park their motorcycles so it is not possible to not walk on the road. I never see any Vietnamese people walking in the street, everyone uses a motorcycle. I find the best way to get around, if I don’t rent a motorcycle, is to use Grab motorcycles or taxis. Thus, it is a good idea to download the Grab app onto your phone; wherever you are it will show your location and you can type in where you want to go or just mark it on the little map. The price will show to your destination, you press “book” and very quickly someone will come to pick you up. It is a cheap and convenient service, and you do not have to bargain a price; everything shows before you confirm by pressing book. There are a few local buses in the city but will be very difficult to explain where you want to go, and they are on set routes. 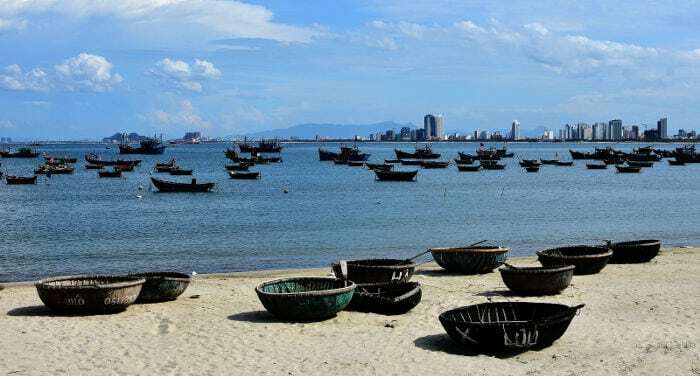 There is plenty to do in Da Nang: if you like the beach the best is My Khe beach, clean and safe any places not safe to swim are signed and also there are lifeguards who do their job and are walking up and down the beach. There are many sights to see around the city but you will need to rent a motorcycle or get some transportation to take you,. In Marble Mountain, which is about 5 kilometers outside the city, you can see caves and many marble factories nearby. Another interesting site is the pagoda with the Lady Buddha statue, which is a few kilometers from the city. You can see it in the distance from My Khe beach. Son Tra Mountain is very high with a winding road to the top, there you can get a beautiful view of the city and sea around it. In the city at night it’s nice to go along the Han river when it is all lit up, the Han bridge which changes color and the Dragon bridge which at 9 pm on Saturday night blows out fire for about 15 minutes. If you like to relax in cafes there are many everywhere with good coffee, as is everywhere in Vietnam. If you are into keeping fit there are many good gyms in the city, with modern equipment. MD Fitness and Kingsport are just two of them in the city center, where many sport and recreation facilities can be found. There are many fruit and vegetable markets in the city and also some large markets where you can buy local handicrafts and souvenirs: Han market on Tran Phu Street Hau Chai District and also Con market opposite Big C in the city center, which is a clothing and herbs market. These are open every day, all day. There are many bars which sell food and beer, from local spots to others that are more for tourists and are found mainly along the Han river and in the bigger hotels. If you like live music try the On The Radio Bar at 33 Duong Thai Phoenix Street, they have a good band every night and free entrance, but drinks are a bit more expensive. Also it gets very crowded and is noisy. You can find small bars which have inexpensive beer everywhere in Da Nang. Restaurants are everywhere and food is inexpensive and good, seafood is fresh and there are plenty of vegetables everywhere, if you like local food try the small places; you can try the noodle soup, which locals eat a lot, but also try the rice and get a set meal of either meat, chicken or fish with vegetables and soup (for around 20,000 VND, which is less than 1 USD). There are also many good vegetarian restaurants, some of the best are in Oung Trung Street Hai Chau District. On the street you can buy French bread sandwiches with meat and vegetables inside freshly made for 10,000 VND. Food in Da Nang is good and healthy: there are many bakeries, which sell fresh bread and cakes, and you will find the service pretty good wherever you eat. Even if they cannot speak any English, they are very helpful, they will show you the food and you can point to what you want. However, it’s a good idea to have an app like Google Translate on you phone. I'm from Liverpool, England. Since my teens I’ve traveled and worked around the world, in my younger days working on yachts motor and sailing, Mediterranean and West Indies; then in the last 30 years around South East Asia working as security, usually on ships and for oil companies. My usual base is in Chiang Mai, Thailand, but I’m currently in Da Nang, Vietnam.